Johnston, Charles F., of Sheffield, twice a member of the House of Representatives from Franklin County, is a young man of unassuming, though dignified, manner, who has won a prominent position in the slate both in his profession and in politics. His father, James J. Johnston, made a competency in farming and stock raising, and now lives a retired life at Hampton. He came from Ireland, locating in Iowa in 1855, and still owns the homestead he entered in that year. His wife was born in Ohio of Scotch parents. Their son, Charles F., was born on the old homestead near Hampton on January 17, 1866. His early education was obtained in the common schools, after which he attended the Hampton High School, and graduated therefrom in 1887. He spent two winters teaching country school, and by working in other ways managed to get enough money to pursue the study of law. He put in some time in the office of Henley & Bedell at Hampton, after which he entered the department of law at the State University. On October 7, 1891, he took the examination before the Supreme Court of Iowa and was admitted to the bar. On September 26, 1888, he opened a law, loan, collection and insurance office at Sheffield, with no law books but Conklin & Bissell's Iowa Justice, and without money. In 1890 he took in as a partner his brother, George A. Johnston, and the business has flourished until now Mr. Johnston is rated in the commercial reports as being worth $15,000. He has always been a republican. In fact, all his ancestors have been republicans since the foundation of that party. He was elected president of the Franklin County Republican Club in 1888, and was mayor of Sheffield for two terms, being at that time the youngest mayor in the state. He was elected a member of the Twenty-sixth General Assembly, and was the first native born citizen to receive that honor from the people of Franklin County. Though not pushing himself forward in that body and thereby frittering away his influence, he was, nevertheless, a potent factor in the enactment of much legislation during the session. He occupied the important position of chairman of the committee on Elections, and was a member of the Ways and Means, Judiciary, Private Corporations, Rules, Building and Loan, Federal Relations, Industrial Schools and the fourth division of the Code Revision committees. 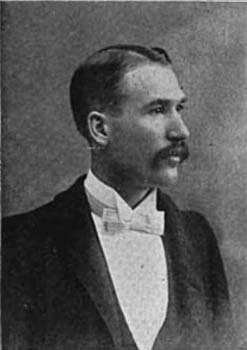 In 1897 Mr. Johnston was reelected by a large majority, and in his seccnd session served as chairman of the committee on Railways and was one of the leaders of the House. He is a member of the Knights of Pythias and has held several high offices in the gift of the order. June 29, 1892, he was married to Miss Emma Delle Hacker, also a native of Franklin County. They have one son, Charles Frederick Johnston, Jr., born January 1, 1895. Mr. Johnston is a Christian gentleman and is a member of the Methodist Church.